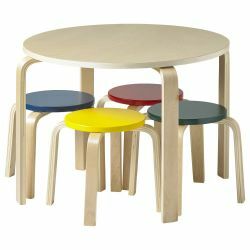 Give little ones a stylish place to meet up for reading time or group work with this Bentwood table and stool set. Sturdy bentwood frame and natural finish makes this a contemporary spot for in the classroom or at home. Each stool has a different color seat so children can pick their favorite, or you can assign them a specific spot. Rounded edges for safety, and stools fit perfectly under table when not in use.